Spirited Lunch-Hour demonstration held at BSNL Corporate Office today. The AUAB organised a spirited lunch hour demonstration today at the BSNL Corporate Office, after serving the notice for the walk-out, rallies, etc. to be organised on 28-05-2018. The meeting that ensued the demonstration, was addressed by Com.P.Abhimanyu, GS,BSNLEU, Com.Mahabir Singh, Secretary, NFTE, Com.G.L.Jogi, Chairman,SNEA, Com.Prahalad Rai, GS, AIBSNLEA, Com. Madhu Trivedi, Vice-President(CHQ), FNTO and Com.N.D.Ram, GS, SEWA BSNL addressed the meeting. The leaders severely criticised the government and the BSNL Management for taking steps to make the Subsidiary Tower Company operational. In one voice, the leaders demanded that the government should roll back the Subsidiary Tower Company. Notice served to the Secretary, DoT and the CMD BSNL, for the 28th May Walk-Out, Rallies, etc. The AUAB served notice on the Secretary,DoT and the CMD BSNL, for organising the Walk-Out, Rallies, etc., on 28-05-2018, demanding the rolling back of the Subsidiary Tower Company. Com.P.Abhimanyu, GS, BSNLEU, Com.Swapan Chakraborty,Dy.GS, BSNLEU, Com.Mahabir Singh, Secretary,NFTE, Com.Rajmouli, Treasurer,NFTE, Com.GL.Jogi, Chairman, SNEA, Com.A.A.Khan, President,SNEA, Com.Prahalad Rai, GS,AIBSNLEA, Com.Sivakumar, President, AIBSNLEA, Com.N.D.Ram, GS, SEWA BSNL, Com.Madhu Trivedi, Vice-President (CHQ), FNTO, and Com.Mohinder,CS, FNTO, NTR were present in the team of the leaders of the AUAB, who delivered the Notice for the agitation. The All Unions and Associations of BSNL gives Joint appeal to the BSNL Non-Executives and Executives, to make the 28th May struggle a success. The leaders of the All Unions and Associations have given a joint appeal to the Non-Executives and Executives of BSNL to make the walk-out and rallies a grand success. In the appeal, the leaders have regretted that, the BSNL Management is holding the Board meeting at Hyderabad, to give approval for the decision of the DoT, to make the Subsidiary Tower Company operational. The leaders have called upon the employees to make the struggles a total success. Corporates pollute the environment - Do not care for the lives of the common people - brutal firing by police in Tamil Nadu, killing ten and seriously injuring more than hundred. In yet another incident, which shows that the government machinery will go to any extent to defend the interests of the big corporates and the multinational companies, 10 innocent people have been killed, and more than a hundred people are seriously injured in the police firing yesterday, at Tuticorin, in Tamil Nadu. The people in and around Tuticorin town have been conducting struggles, demanding closure of a copper smelter unit, belonging to the Sterlite company. This company is a part of the multinational Vedanta Group. This smelter unit has been causing serious health hazards to the people of Tuticorin city. Serious health problems like cancer, kidney ailments are being caused due to the pollution created by this smelter unit. This is yet another example which shows that big corporates have no care for the environment or the health of the people, but making big profits is only their ambition. BSNLEU strongly condemns the Tamil Nadu government for this brutal police firing. BSNLEU also strongly demands the immediate closure of Sterlite smelter unit at Tuticorin and appropriate compensation to the families of the victims and injured. Those killed in the police firing at Tuticorin. BSNLEU Tamil Nadu circle union and TNTCWU conduct protest demonstrations, condemning the Tuticorin police firing. The Tamil Nadu circle union of BSNLEU, and Tamil Nadu Telecom Contract Workers Union (TNTCWU) have given call to conduct protest demonstrations throughout Tamil Nadu, today, condemning the brutal police firing in Tuticorin, in which 10 innocent people are killed and more than 100 people are seriously injured. Kerala circle union organises Com.Moni Bose memorial lectures at four centres. Kerala circle union organised Com.Moni Bose memorial lectures at Trivandrum, Alappuzha, Ernakulam and Kozhikode on 19.5.2018. The lectures were, on ‘Neo-Liberal policies and ‘communal harmony’. At Trivandrum, the lecture was delivered by Com.M.Krishnan (Secretary General, Confederation of Central Government Employees & Workers). At Alappuzha, Com. R.Aravindakshan Nair (All India Treasurer, AIBDPA), delivered the lecture. At Ernakulam and Kozhikode, the lectures were delivered by Com. V.A.N. Namboodiri, Founding General Secretary, BSNLEU, and Com.K. Damodaran, Director, Keluvettan Padana Kendram. CHQ heartily congratulates the Kerala circle union for organising these lectures. Views of the Street Corner meetings held at Kerala circle. Andhra Pradesh circle union organises Com.Moni Bose Memorial Lectures. The Andhra Pradesh circle union organised Com Moni Bose Memorial Lectures on 19th, as a part of it's circle executive committee meeting, held at Vijayawada. The lecture on “Neo-Liberal Economic Policies and the Alternative” was delivered by Com A.V.Nageswara Rao, State Secretary, CITU, AP. The lecture on "Communal Harmony and secularism" was delivered by Com.M.V.S.Sarma, Editor, Prajasakti and Ex.MLC. Com J. Sampath Rao, Circle Secretary, Telangana Circle, also addressed the meeting. CHQ heartily congratulates the Andhra Pradesh circle union for successfully organising Com.Moni Bose Memorial Lectures. BSNLEU heartily congratulates the nearly three lakh Gramin Dak Sevaks (GDS) of the Postal Department for the magnificent united all India Strike. All the four GDS Unions (AIPEU-GDS, AIGDSU, NUGDS & BPEDU) are on an indefinite strike from today the, 22 May 2018. All the postal employees’ unions have supported the strike. As per reports the strike is total and 1,29,500 Branch Post Offices remained closed. More than 60% of the employees of the Postal Department are GDS and more than 80% of the Post Offices are GDS Branch Post Offices. Major revenue of the department comes from GDS. Still, they are not treated as Postal employees and are paid a pittance. The Gramin Dak Sevaks have a great legacy of struggles and whatever facilities they are enjoying at present is the result of their bitter struggles along with the postal employees. This strike was forced by the NDA government which not only denied to address the long pending demands of the Gramin Dak Sevaks for regularisation as government employees, but refused to implement the recommendations of Kamalesh Chandra Committee Report on the service conditions of the GDS. BSNLEU expresses solidarity with the striking employees and demands that the NDA government must immediately settle the issue by agreeing to the just demands of these grass root level workers who deliver valuable service to the common people. Telangana circle union conducts meeting, in memory of Com. Moni Bose. Telangana circle union of BSNLEU, conducted a meeting, to commemorate the 8th death anniversary of Com.Moni Bose, on 19-05-2018, in the Union office at Hyderabad. Com.Ramachandrudu, District President of Hyderabad Telecom District, presided over the meeting. Com.M.N.Reddy, General Secretary, All Pensioners Associations, Telangana State, spoke on Neo Liberal Policies and its impacts. Com.G.Sambasiva Rao, ACS also addressed the meeting. BSNLEU, Karnataka circle organised Com.Moni Bose memorial lectures on 19.05.2018. The Karnataka Circle Union of BSNLEU, organised Com.Moni Bose memorial lectures at Davangere, on 19-05-2018. Dr.Chandra Poojari, Professor, Department of Development Studies, Kannada University, Hampi, delivered the lecture on Neo liberal policies and Communal Harmony. District Secretaries, Presidents, Circle Executive Committee members and branch members from Bangalore and Davangere participated in the program. The contributions of Com. 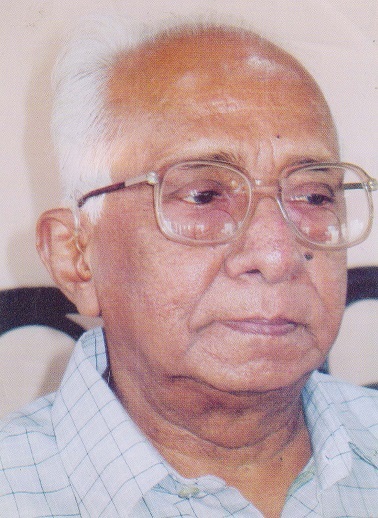 Moni Bose, the doyen of P&T trade union movement, as well as the General Secretary of the AITEU CL III, was remembered. The participants and resolved to march ahead in the path shown by Com.Moni Bose. General Secretary addresses Chennai Telephones circle executive committee meeting. The circle executive committee meeting of Chennai Telephones circle was held today the 21.05.2018. Com.P.Abhmanyu, GS and Com.S.Chellappa, AGS, attended the meeting. Com.E.Natarajan, circle president, presided over the meeting. Com.M.Kanniappan, circle secretary, welcomed everyone and placed his report on activities before the house. Com.P.Abhimanyu, GS, addressed the meeting and spoke at length on various important issues like wage revision, Subsidiary Tower Company, revival of BSNL, 5th September Worker Kisan Sangarsh Rally at New Delhi, etc. Com.S.Chellappa,AGS, also addressed the meeting and spoke on important issues. Serious discussions by executive committee members took place, regarding strengthening the democratic functioning of the Union and streamlining the functioning. The meeting decided to send 200 comrades to the 5th September New Delhi rally and to conduct a young workers convention soon in Chennai circle. Com.S.Hemavathy, circle treasurer, proposed vote of thanks. Andhra Pradesh circle executive committee meeting held at Vijayawada. The circle executive committee meeting of Andhra Pradesh circle is held in Vijayawada in a jubilantly. More than 250 comrades, including 50 lady comrades, participated. The meeting was presided over by Com. K.Prabakar Rao, Circle President. Com.N.Ramarao, DS, Vijayawada, welcomed everyone. Com.S.Chellappa, AGS, addressed the meeting and reported on the decisions of the Agartala CEC meeting. He also explained about the government's Neo-Liberal Policies, Wage Revision and the Subsidiary Tower Company issues. Discussion took place on the report submitted by the Circle Secretary. A Seminar on "Revival of BSNL and Draft National Digital Communication Policy was held. Shri Y.Ravindrnath, GM(HR) and Com. P.Asoka Babu, Vice-President (CHQ) spoke on it. The CEC meeting was also addressed by Com.K.Dharmarao, CS, BSNLCCW, Com.Ramadevi, Member, BSNLWWCC and Com.K.S.C.Bose, CS,AIBDPA. Four circle unions of BSNLEU organise Com.Moni Bose memorial lectures at Kolkata. Com. Moni Bose memorial lectures on Neo-Liberal Policy & Communal Harmony were organised at CTO hall, Kolkata. It was organised by the four BSNLEU Circle Unions West Bengal, CTD, Stores & Factory. Before deliberations started, the leadership of the four circles paid homage to our beloved leader Com. Moni Bose. Com. Asis Das, Asstt. Circle Secy., West Bengal Circle, Com. Sisir Roy, Circle Secy, CTD and Com. Om Prakash Singh, VP (CHQ) & Circle Secretary, Telecom Factory circle, spoke on the works, ideology and struggles of Com. Moni Bose in a packed auditorium. Com Nazez Nouroz, Com. Prabir Dutta and Com. Sekhar Bhattacharjee jointly presided over the meeting. BSNLEU fondly remembers Com. Moni Bose, on his 8th death anniversary. Com. Moni Bose, former General Secretary of the AITEU CL-III union and our beloved leader, passed away on this day in 2010. On the day of his 8th death anniversary, the leaders and members of BSNLEU fondly remember the contributions of Com. Moni Bose to the working class movement and resolve to march forward in the path shown by him. Jan Ekta Jan Adhikar Andolan (JEJAA) demonstrations on 23.05.2018. The Jan Ekta Jan Adhikar Andolan (JEJAA), an umbrella organisation of trade unions, kisan and other mass organisations, has given call to conduct demonstrations at state capitals and at Delhi on 23.05.2018, against the anti-people pro-rich policies of the Modi government. CHQ calls upon the circle and district unions to actively take part in this programme. BSNLEU observed the 8th death anniversary of Com.Moni Bose, by organising a memorable educative programme. BSNLEU observed the 8th death anniversary of our beloved leader, Com. Moni Bose today, by organising a memorable educative programme at New Delhi. In the programme, organised in K.G.Bose Bhawan, two intellectuals, viz., Dr. Prabhir Purkayasta of Delhi Science Forum and Dr.Satyaki Roy of Institute of Studies for Industrial Development, delivered lectures on Neo-liberal Policies and Communal Harmony. Com.Sushmita, daughter of Com.Moni Bose, greeted the function and briefly shared her memories about Com.Moni Bose. 65 selected leaders and comrades from the Northern circles, took part in this educative programme. Com. R.K.Mishra, CS, UP(East) and Com.Ashok Pareek,CS, Rajasthan, presided over the morning and afternoon sessions, respectively. Com.Swapan Chakraborty, Dy.GS, welcomed everyone and Com.P.Abhimanyu, GS, delivered the introductory speech. All the participants expressed their appreciation to the CHQ, for organising such a memorable programme. Hon'ble Minister of Agriculture, Government of Pondicherry, addressed Street Corner meeting at Kumbakonam, Tamil Nadu circle. Street Corner meetings have been conducted throughout the country, as per the call of the AUAB, demanding the rolling back of the Subsidiary Tower Company, as well as against the anti-BSNL and anti-PSU policies of the government. In many parts of the country, the leaders of the AUAB had taken innovative steps to make the programme more meaningful. Kumbakonam district of Tamil Nadu circle is one such place. The leaders of AUAB of Kumbakonam, mobilised the support of all the major political parties for the struggle. 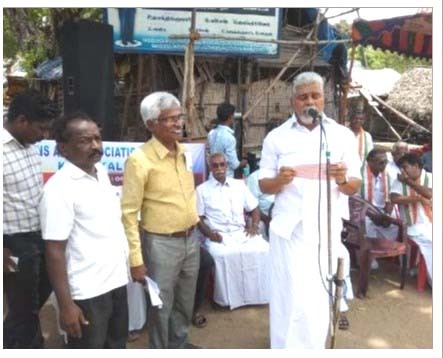 In a meeting held at Karaikkal (coming under Pondicherry state) bus stand on 09.05.2018, leaders of all political parties addressed and expressed their support and solidarity for the struggle. Among those who addressed the meeting was Shri Kamalakannan, Hon’ble Minister of Agriculture, Government of Pondicherry. He strongly criticised the decision of the government to break BSNL, by forming the Subsidiary Tower Company. He also stated such steps of the government are unwarranted, at a time when BSNL is heading for it’s revival. CHQ heartily congratulates the AUAB leaders of Kumbakonam district.